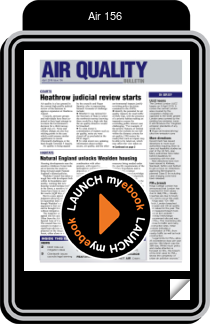 Air quality is a key ground in the current high profile judicial review of the decision to approve expansion at Heathrow Airport. Housing developments near the sensitive Ashdown Forest look set to become far easier to bring forward under Natural Englandâ€™s diluted policies. The Central London ULEZ begins on 8 April 2019. It covers the central London area covered by the congestion charge (as opposed to the wider greater London area covered by the existing low emission zone). It will introduce the â€œtoughest emission standards of any world cityâ€�. Government has issued directions to more local authorities requiring them to carry out feasibility studies as part of the UKâ€ˆNO2 plan. Many authorities have fallen behind deadlines for complying with the plan. Kings College London has announced that London has breached EU limit values â€“ due to daily PM10. Usually breaches are due to hourly NO2 (yet to occur this year). NICE â€“ which sets guidelines and standards on health â€“ has finalised its air quality â€˜standardâ€™. 14 local authorities will share Â£25 million from the Clean Bus Technology Fund. Clientearth has warned 38 local authorities of the legal consequences of not tackling air pollution. Election purdah is not an excuse for inaction, Clientearth warns. A comprehensive review of research on the impact of 20mph limits has been released. A Â£56 million research programme has been launched on public health. A car finance firm has found â€œworryingâ€� public confusion over clean air zones just days ahead of the introduction of Londonâ€™s low emission zone. But most accepted the need for zones. Primary school pupils will carry special backpacks with novel air quality sensors on their journey to and from school in London. Ten London hospitals in polluted areas are to receive new air quality monitors â€“ also part of the Breathe London project (see news above). A proposed post-Brexit environment watchdog will have teeth, claim environment ministers Michael Gove and ThÃ©rÃ¨se Coffey. London Councils has been working on developing new clean air legislation proposals with the boroughs since last year. The European Parliament has backed a motion supporting a tightening of EU air quality laws. A new â€˜Herts & Beds Air Pollution Alert Systemâ€™ website and notification service will be run by Ricardo. Two roadside sites exceeded annual mean NO2 objectives in Northern Ireland in 2017, the Northern Ireland annual report just released notes. A five-day particle pollution episode affected London and most of the UK. The UK recently breached its PM10 daily allowance limit allowed under the directive (see p1). Basildon has rejected introducing a charging clean air zone â€“ but will use speed limits to tackle pollution hotspots on the A127 in Essex. Defra has released ammonia inventories for 2017 and 2016 as required under EU reporting rules. The UK has set out zones that pass and fail under EU air quality reporting rules for 2016 and 2017. Steve Barnes of Gramm Barriers is promoting Smogstop as an effective barrier. It has a double wall to act as a baffle which directs polluted air over photocatalytic coatings to increase the impact. Researcher John Gallagher has been behind many of the studies on air quality barriers and is now at the University of Dublin. Even clean woodburning stoves may not be clean if used badly, researchers suggest.